John Steinbeck’s novel Of Mice and Men was an unexpected success when it was published; but as I understand it, he was still somewhat dissatisfied with the final text of his book. 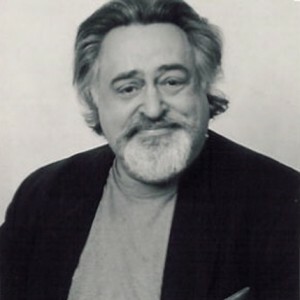 George Kaufman, who was one of the top directors in the USA in the 1930s, and was half of the Kaufman and Hart playwriting team, persuaded Steinbeck that Of Mice andMen would make a fine play for himself to direct on Broadway in 1937 where it was, if anything, an even bigger success than the novel. Kaufman, more importantly, advised Steinbeck on all the dramaturgy and also about how to improve the story with extra attention being given to certain characters, especially Curley’s wife. I believe it was this version of the tale that was filmed by Lewis Milestone in 1939. This is this somewhat improved and extremely atmospheric version that is touring the country now. The playwright, therefore, is not someone who adapted the novel but is John Steinbeck himself; this is the dramatic version that gives us his last thoughts on the story; and in this production evocation of the background of Depression America and the anger about the inequity of the lives of itinerant workers is not just strongly felt and present in itself; this telling of the story reminds one that Steinbeck went on to write the more complex and powerful The Grapes of Wrath. 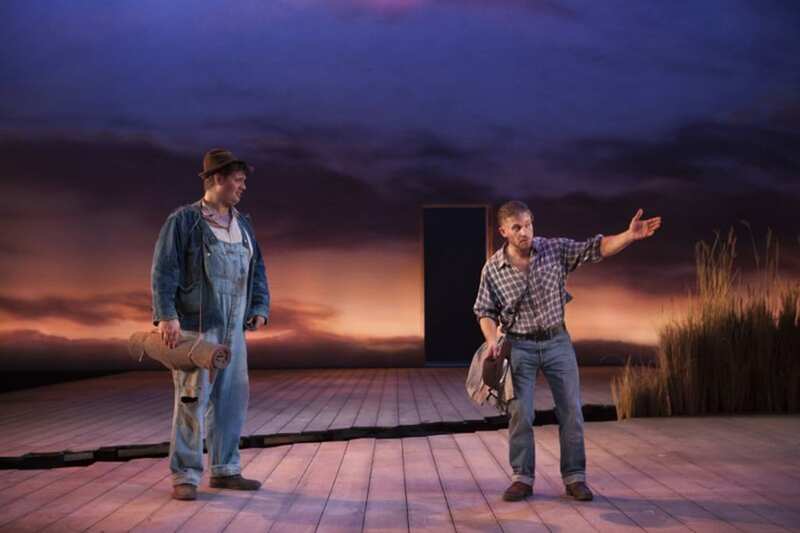 Of Mice and Men is a tale of friendship and the importance of the bonds that can form between people, even people as mismatched as George and Lennie. The intellectually fierce and even feral but tiny George looks after mentally retarded Lennie who is powerfully strong and tall. They are, in their different ways, both decent human beings living in an indecent world. The other characters represent a range of types and personalities from the evil, destructive, cruel Curley to the intelligent, feeling Slim. 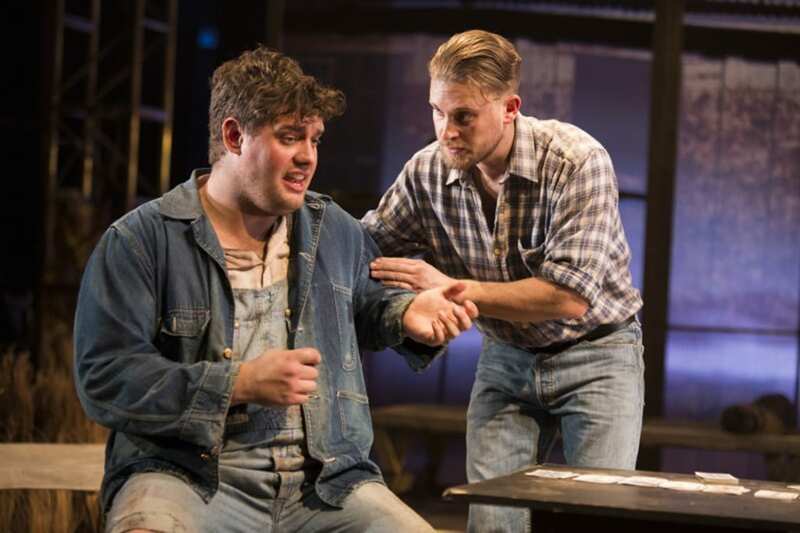 The play is brilliantly constructed and builds powerfully to its tragic ending. It works on the level of direct realistic representation of the world and the times in which it is set; as a parable; and as a collection of symbolic moments and events. Director Roxana Silbert has the full measure of the drama and has assembled actors who play their roles convincingly, though I have to say that the American accents did slip from time to time on the night I attended. I didn’t mind. I was too hooked on seeing the story working out. The set design by Liz Ascroft is exemplary in representing rural Salinas county; and the action is compelling from the moment the play starts with the famous folk song (clearly ironic in this situation) “This Land is Your Land, This Land is My Land.” Physically William Rodell’s George and Kristian Phillips’ Lennie are totally right for their parts and their readings of their roles are touching and convincing engaging the audience emotionally almost immediately. 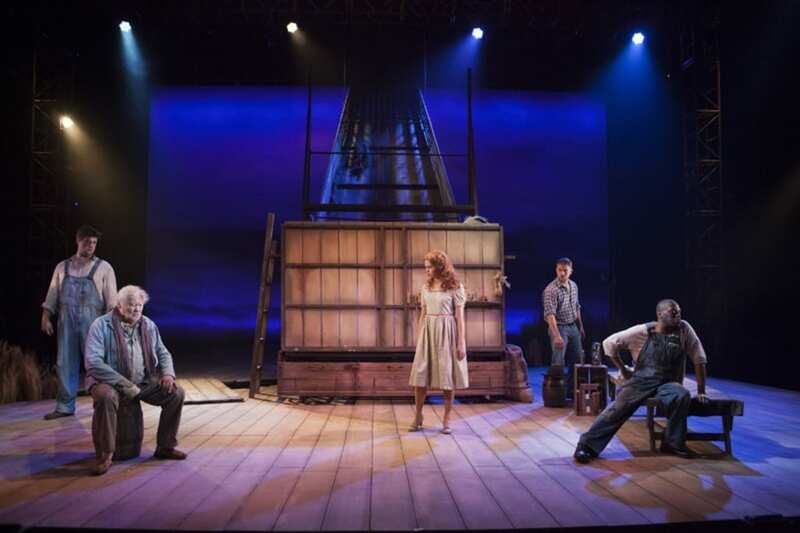 Saoirse-Monica Jackson in her professional stage debut is lovely, desperate and touching as Curley’s unhappy wife. 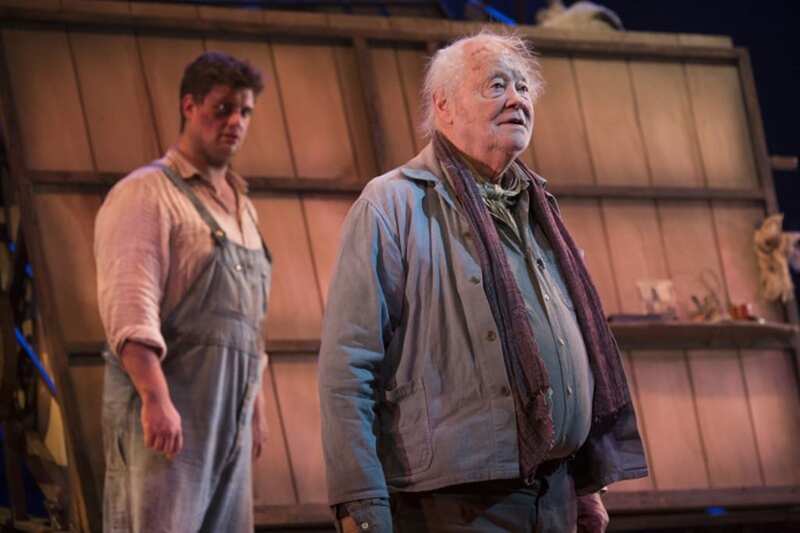 Dave Fishley brings the different role of Crooks to life and represents in one character all the racist and other prejudices of the era; Dudley Sutton renders the sad, lonely aging of Candy and his newborn hopes after meeting George; and Jonah Rusell also stands out as the sane, compassionate, decent Slim, one of the few characters of broader understanding. This is an excellent rendering of a classic work that will have you debating its meanings and nuances for days afterwards; and, hopefully, send you back to the novella, the excellent film versions or even to The Grapes of Wrath. 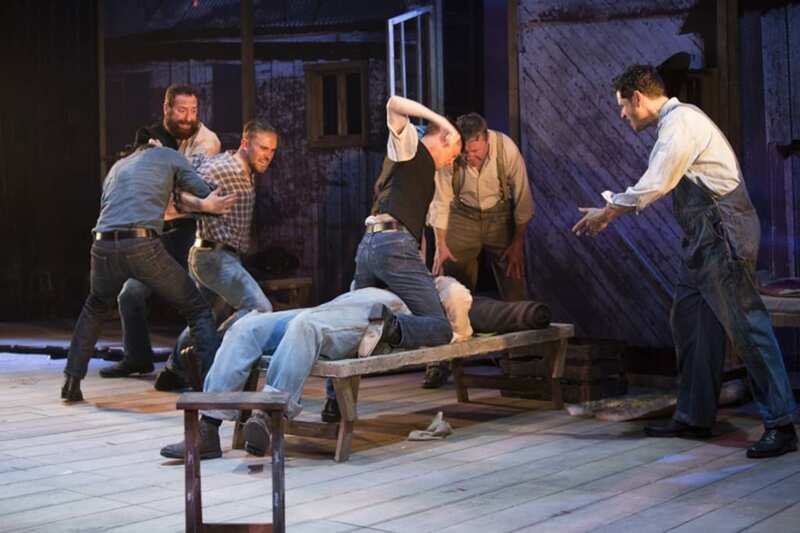 The play has been touring successfully since February when it premiered at the Birmingham Rep and will continue until the end of May, moving on now from Oxford to Leicester. I recommend strongly that you see it if you can.